In honor of the upcoming National Trails Day (June 3), we’re hoping to find out which Kansas town / city you think is the best one for trails. Whichever location gets the most votes will be honored as our Top Trail Town of the Year 2017, and we’ll be sending a free copy of our book to the winning town’s public library. We’ve included in our poll the places that are expanding their trail system, have embraced the local trails, and embody the spirit of adventure on the plains. Iola has the Thrive Allen County campaign as well as being the trailhead for the Prairie Spirit Trail, Southwind Rail Trail, and the Lehigh Portland Trails among others. Marysville combines the old and new trails of Kansas. It’s home to the recently completed Blue River Rail Trail that extends into Nebraska as well as the Pony Express Trail and Oregon Trail. The Kansas Sampler Foundation named it the Trails Capital of Kansas. Topeka is the trailhead for the Landon Nature Trail, which starts at the historic site of Brown v Board of Education, it has the only set of trails outside of a Governor’s Mansion, and it’s an access point for the Kansas River Trail. Lawrence is another stop on the Kansas River Trail, and it has a plethora of well-loved and well-maintained trails including the KU Field Station, Clinton Lake, and the nearby recently restore and expanded Baker Wetlands. Did we leave one out? Let us know and let us hear your vote! 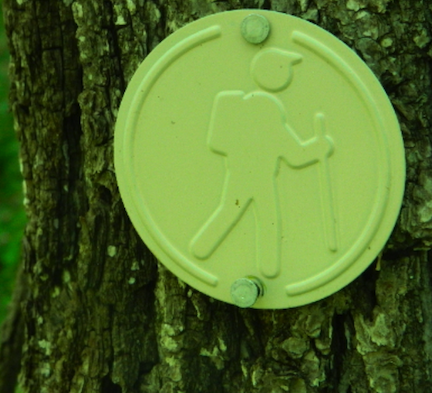 This entry was posted in On the trail and tagged national trails day. Bookmark the permalink. I vote for Iola. Not only have they built several trails in the last few years, they have established a new bike shop and a free bike sharing program. What’s NOT to like about the Lehigh Trails? Here is a link to a helmet cam view of the trails that was posted to youtube just a couple of days ago. https://www.youtube.com/watch?v=vJqNIm6ML94&feature=youtu.be After enjoying the video… go ahead and vote for Iola as the Kansas Top Trail Town 2017.